I’m what you would say a right-brained person. In fact, I took one of those tests a while back and it claimed that I am 98% right-brained…so 2% logic (if i did that math right? lol). That feels quite accurate to me! I would venture to say that many aspiring professional artists face the same challenges as I do. Time management, motivation, inspiration, execution, and all of the behind-the-scenes requirements can feel overwhelming at times. I have been creating professionally for several years now. Within that time frame, I was finally able to quit my day job and focus 100% on my art in order to make a sustainable living. I still pinch myself when I get to say that…please don’t think for a minute that I take it for granted! I know how rare it is that someone gets to work for themselves, doing something that they absolutely adore and couldn’t live without. However, it took a ton of hard work, frustration with many obstacles, and perseverance in order for me to get to the point that I am now. Here are some of the things that I have learned along the way so far in my journey as a professional artist that may help some of you out there, whether you are starting out or at a stalling point. Make yourself a general schedule, and stick to it. My studio is at home, and it is sooooo easy for me to get distracted by other things (Look! There’s a squirrel in my bird feeder!). Find your peak creative and working times, and build your schedule around that. I am definitely much sharper in the morning, plus I have a nine year old daughter who is out of the house until about 3pm, so that in itself is a huge consideration for my schedule. Most weekdays, I wake up, haul her off to school, and run to the gym directly afterward to get that necessary evil out of the way for the day (the gym being evil…not my kid. She’s awesome.). Afterward, I head home and tackle whatever tasks I have for my work that day, be it painting, admin, website updates, supply orders, social media, etc. (More on THAT catch-22 later). A few of my pieces at a past show, “Reverie” at AVA Gallery in Davidson, NC. 2. I also attempt to have a designated chunk of time for everything outside of painting, which I try to do in some fashion every single day. Painting is like breathing to me, and I get a little cagey if I don’t do it on the regular. I am currently a one-woman show over here, so that means everything else…all of my photo editing, web maintenance, installations, client correspondence, supply ordering, appointment setting/consultations, marketing and networking…it’s ALL me. That means that there is ALWAYS something that needs to be done! I keep a journal and calendar with me at all times (the actual paper kind, it helps me to remember things more, and keeps me from staring at a screen any more than absolutely necessary). It may be a jumble of chicken scratch ideas and scatterbrained mishmash to some, but it works for me and my right-hemisphered brain! Cricket the studio dog, not amused with the size of the current week’s supply order. 3. I also save one block of time per week for things that are not work related but need attention…the nuts and bolts of life such as bill paying, meal planning, car maintenance, doctor and vet visits, house and yard maintenance, etc. Sometimes it’s not realistic for those things to fall on a specific day, but for me, there’s a better chance of them getting done if I have a few of them clumped together. That way, I can look forward to more uninterrupted active studio time on most other days. 4. I typically have two or three projects going at once. It helps me to step away and avoid getting tunnel vision on one piece. In between commissions, it is also important for me to leave some wiggle room for studies and experimentation. Although I appreciate artistic consistency, I’m not the kind of artist that likes to do the exact same thing over and over and over again…I like to mix things up a little, which is evident in my portfolio. That leads me to giving some advice that has been of the utmost importance to me. You WILL experience “failure” and “mistakes” along the way. They are imperative to growing as an artist, almost more imperative than creating an actual masterpiece. For every painting that I feel is a success, there might be two or three or more that wind up in my “time out” pile, or the trash, to be frank. It has happened enough to me now that I almost get excited when I have a failure…it means a breakthrough is right around the corner, and it actually encourages me to keep going. Stepping back to avoid the dreaded tunnel vision. 5. Rest is just as important as work. I’m not just talking physical sleep, here, although Mama does love her sleep, don’t get me wrong. 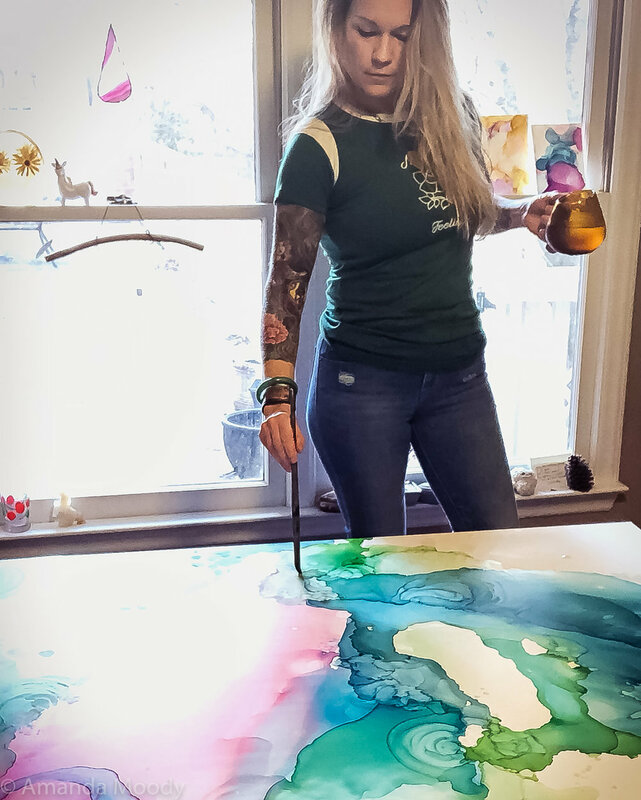 I’ll sometimes have a period of time where things are flowing along, I’m cranking out numerous paintings, jiving with the energy in the studio, and then WHAM! All of a sudden it seems as if either inspiration comes to a screeching halt, or some life circumstance happens that forces me to step away from actively painting or producing for a few days. 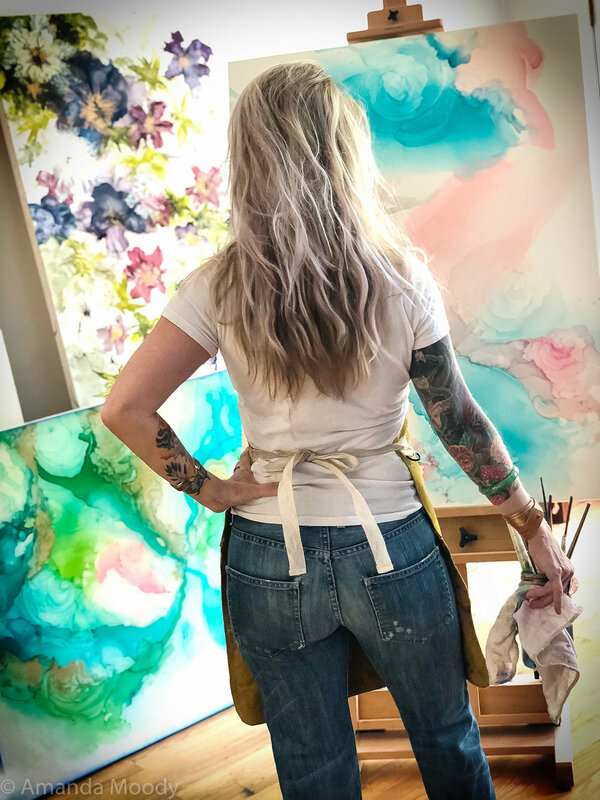 Awhile back, I would get really frustrated and panicky at these times, but now I see that stepping back is absolutely necessary for my creative process, and I try to set aside time for travel, rest, exercise, and things that inspire and rejuvenate me. I now think of these times as incubation periods…time to take a break, get my bearings, maybe have a complete chunk of time off to get away and renew, go see something inspiring, or even handle some mundane factors in life that are weighing on me…whatever it is that isn’t directly related to my work calendar. Then I can step back into the studio with fresh eyes. You don’t always have to go as far as Versailles for inspiration…but damn, it sure does help! 6. Networking. I used to absolutely cringe at the mere thought of that word; I’m actually hearing ominous music in my head right now as I type this. My personality is pretty bubbly and happy in general, but meeting new people for the first time on my own gives me heart palpitations, and not the good kind. In the past, it has also been difficult for me to talk about myself. During my first couple of solo shows, I probably seemed like a deer in headlights, making self-deprecating comments and blushing. I am much better about it now, but only because I literally HAD to face my fear of public speaking if I wanted to make a living doing this. And boy, did I ever. Every time I took even a small leap forward, putting myself out there, it became a little bit easier. I still struggle sometimes, and probably always will in the back of my mind, but it has helped to see that people DO respond to what I am doing and DO genuinely seem interested and uplifted by my work. That’s exactly why I do what I do for a living, right there. I just try to focus on that when I feel like sticking my head in the sand, and the anxiety then tends to melt away. The upside of all this is that in putting myself out there more, I have met some truly interesting kindred spirits and professional connections as a bonus. Noelle Muñoz and Whitley Adkins Hamlin, two of my newer-found kindred spirits in my life! 7. That leads me to everyone’s favorite topic: Social Media. Boy, what a double edged sword it is, right? I am truly grateful for Instagram especially…I know people complain, but it’s FREE marketing, man…or so far it has been at least. Instagram and Facebook have given me 77% of my business in the past six years, which I feel is quite incredible. All the algorithm ups and downs can be frustrating and confusing and downright annoying at times, but what has worked for me the most is just not caring too much about all that. I do try to post something relevant or (hopefully)inspiring every day, and if I don’t have anything particular to share, I just don’t force it. I also make a huge effort to respond to everyone who takes the time to interact with me on my posts. There is so much fake-ness out there in the virtual world, and that just is not who I am. Who wants fake followers, anyway? The whole point of social media is connection. I would rather share things about my work and myself that are true to me, than perform whatever dog-and-pony-show happens to be popular in the virtual world at any given moment just to book a commission. My best advice: Do whatever works for YOU, and what feels like YOUR truth. If that means posting nineteen selfies a week and buying followers, then more power to you! You just won’t see that from this girl here…I would just rather be painting. Slow and steady really does win the race after all! Me and one of my bigger babies at Herron and Smith Dentistry in Charlotte, NC.